CARACAS - Venezuela launched a country-wide manhunt on Monday for the men who assaulted an army base the day before, using state TV to flash pictures of the accused rebels who escaped with weapons after a gunfight with soldiers. The attack came just hours after the first session of a new legislative superbody created by President Nicolas Maduro, which opponents say will cement dictatorship after months of deadly protests in the oil-rich but economically-ailing country. 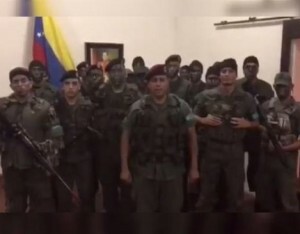 Those who attacked the base near the city of Valencia said their operation was aimed at starting an insurgency against unpopular leftist Maduro. No more assaults were reported, and anti-Maduro protests in Valencia were quickly subdued, but hackers attacked dozens of state websites to show their support for the raid. Defense Minister Vladimir Padrino said in a televised address that two of the men who attacked the base had been shot dead and eight captured. About 10 others are on the run. "This band of criminals did not act out of noble ideals or patriotic principles of any kind. They operated as mercenaries paid by extreme right-wing groups in Miami," he said.